” We have highlighted the racist social attitudes that dehumanised, denigrated and sexualised Aboriginal and Torres Strait Islander peoples, and empowered perpetrators by providing legal and social sanction to high levels of sexual and other violence committed against Aboriginal and Torres Strait Islander peoples. The Royal Commission into Institutional Responses to Child Sexual Abuse commissioned the Telethon Kids Institute to collaborate on a report examining the question of Aboriginal and Torres Strait Islander children’s past and contemporary vulnerability to child sexual abuse in institutional contexts. The research team was guided and supported by the advisory group and the Royal Commission’s Aboriginal Knowledge Circle. Adjunct Professor Muriel Bamblett, AM, Yorta Yorta and Dja Dja Wurrung woman, CEO Victorian Aboriginal Child Care Agency (VACCA). Professor Leah Bromfield, Professorial Fellow, Royal Commission. Ms Karen Menzies, Wonnarua woman, child protection expert and lecturer at the Wollotuka Institute, University of Newcastle. Mr Glenn Pearson, Noongar man, Manager Aboriginal Research Development at the Telethon Kids Institute. The research team drew on the substantial expertise, knowledge and experience of the advisory group. The research team and advisory group worked together in an iterative process of reviewing material and filling gaps in existing evidence. While the research team could only draw on material that has been documented and evidenced, they acknowledge that there is much evidence that is oral and much work needed to be done to overcome the inherent bias in the kinds of accounts that make up the historical evidence base. Both the advisory group and the Aboriginal Knowledge Circle provided cultural governance over this project and were also critical in contributing their knowledge of oral histories so that the researchers could go back and look for documented evidence of events. The research team also reviewed national and state inquiries that addressed, in whole or part, the past and present vulnerability of Aboriginal and Torres Strait Islander children to physical, emotional and sexual abuse. The research report released by Royal Commission into Institutional Responses to Child Sexual Abuse last Wednesday advises a strong connection to culture can help protect Aboriginal and Torres Strait Islander children from being abused in institutions. While noting there is no comprehensive data available, the researchers theorised from historical evidence it is likely that Indigenous children face a heightened risk of child sexual abuse in institutions compared to non-Aboriginal children. The report also cites a growing body of Australian and international evidence that reconfirms that a positive connection to culture acts as a shielding factor, by helping children develop their identities and self-esteem, emotional strength and resilience. Royal Commission CEO Philip Reed said in a statement: “When Aboriginal and Torres Strait Islander children are separated from culture, they are more likely to be separated from the protective factors that support high-self-esteem, secure attachments and a strong and positive social network”. The report correlates the findings and data of previous reports and inquiries, such as the ‘Bringing them Home’, ‘Lost Innocents’, ‘Forgotten Australians’ and ‘Listen to Children’, amongst other resources and investigations. It delves into the history of the overt sexualisation of Aboriginal and Torres Strait Islander women and children, who often experienced sexual assault by white men, in communities, pastoral lands, and later faced heightened vulnerability when placed in missions and residential institutions, where they were overrepresented. The report also dives into how historical discriminatory social attitudes worsened the sexual abuse risks experienced by Indigenous people, as a lack of condemnation allowed the mistreatment to thrive in the past. “The dismissal of serious allegations of violence ‘sanctioned the sexual abuse of Aboriginal and Torres Strait Islander women and girls’ and therefore allowed abuse to continue unchecked’,” the report reads. However, the report states that at present “there is nothing inherent about being Aboriginal or Torres Strait Islander that predisposes children to being victims of child sexual abuse [in institutions]”, despite not being able to ascertain if Aboriginal and Torres Strait Islander children experience child sexual abuse in institutions at higher rates than non-Aboriginal children. Despite the above statement, the report also found Aboriginal children face more of the known risk factors for child sexual abuse in institutional settings compared with non-Aboriginal children. The report also outlines the presence of “significant barriers to disclosure for all children who have experienced child sexual abuse, with additional barriers experienced by Aboriginal and Torres Strait Islander children”. These include fears of reprisals, isolation from service providers in remote communities, shame and a lack of understanding and support on how to deal with it. The report’s conclusion does not shy away from admitting the negative effects that past government policies have had on generations of Aboriginal and Torres Strait Islander peoples, and calls out the damaging intergenerational impacts of past policies and practices of “structural and institutionalised racism”. “Our review of government inquiries confirms that in the past, sexual abuse of children in institutions was widespread. There is no comprehensive data to know how many Aboriginal and Torres Strait Islander children experienced sexual abuse in these institutions. However, due to discriminatory laws, policies and practices of ‘protectionism’ and assimilation, Aboriginal and Torres Strait Islander children were institutionalised in higher numbers than non-Aboriginal children and therefore were more likely to be exposed to child sexual abuse in institutions. 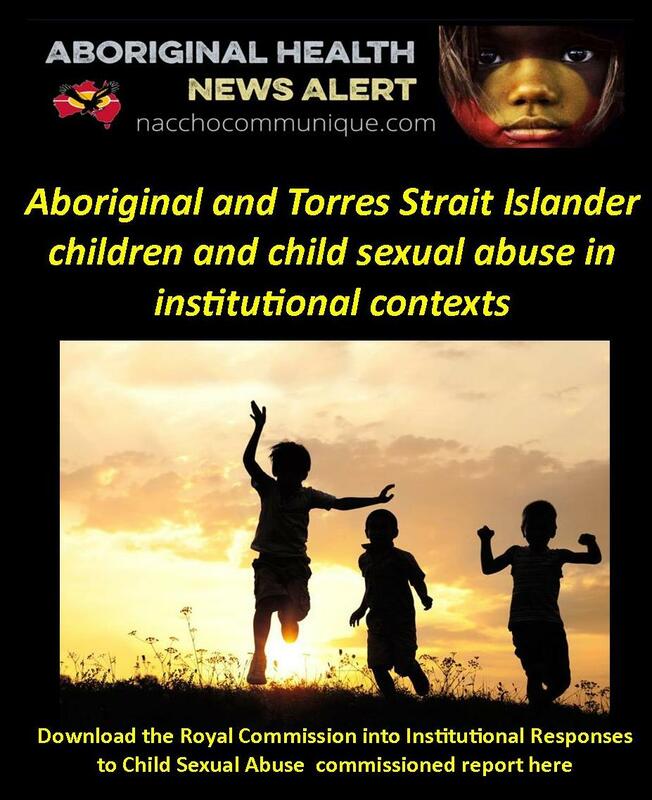 “Aboriginal and Torres Strait Islander children also appeared to be more vulnerable to child sexual abuse in institutional contexts because institutions for Aboriginal and Torres Strait Islander children were even less regulated than institutions for non-Aboriginal children and lacked safeguards. Aboriginal and Torres Strait Islander parents had no legal rights to care for, advocate for, or otherwise protect their children. “Colonisation, ‘protectionism’ and assimilation also severely disrupted Aboriginal and Torres Strait Islander peoples’ relationship to kin, community and country, and prohibited the practice of Aboriginal and Torres Strait Islander cultures. In this way, the missions system broke down the traditions, lore and practices of communities that previously kept children safe. When the missions system ended, governments and churches left the missions with no infrastructure or resources to replace traditional lore or custom ((Best and Lucashenko, 1995; Blagg, 2000; Keel, 2004; Robertson, 2000). The research was produced in collaboration between a team of researchers, the royal commission and a research advisory group made up of prominent Aboriginal Elders and academics. In its final paragraph, the report also acknowledges the Australian First People’s continuing calls “for all government to directly involve them in any and all decisions that affect them and the lives of their families”.